I have been on holiday now for nearly a week and that can only mean one thing! Illness!! It started last Saturday and has had me feeling pants until today. I have managed to make it out of bed and dressed and feel almost human. Appologies for my absense (I have a note from my mum)! 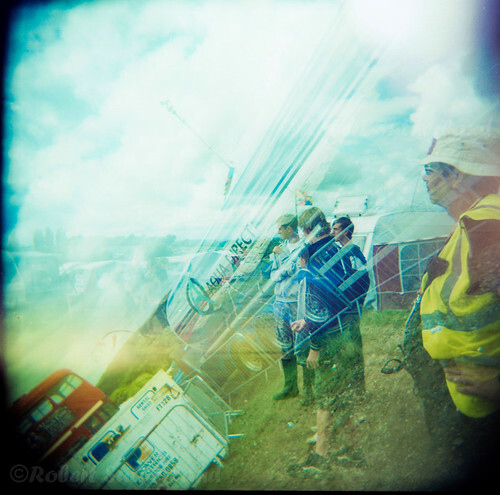 One thing I have been able to do whilst ill is scan my films from Greenbelt. These shots were taken using a Holga on fuji velvia film that was then cross processed. Check them out on my flickr account. Not sure what all that means but they are very cool. It means that during the summer I was playing about with a big bag of free film and a toy camera. But I do like the results. It is a totally different ball game to my DSLR! Hope you’re feeling better now, Robb. Keep up the creativity in 2009! Thanks Carole. Feeling a lot better now! It’s been a wierd year. I’m now on holiday. Being on holiday from church feels wierd. Even though we’re visiting all the churches that have supported us over the years it is still quite disconnecting. It has meant that Christmas hasn’t been very Christmassy….